Tranquil Bush Setting with Sea Outlook. Property 27: Tranquil Bush Setting with Sea Outlook. Quality Architecturally Designed Home. Great Winter Home with fire place. Property 32: Quality Architecturally Designed Home. Great Winter Home with fire place. 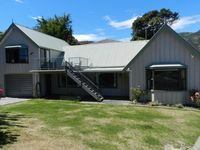 Property 41: Ultimate Akaroa family retreat! Stunning Views,All Day Sun and Amazing Sunsets. 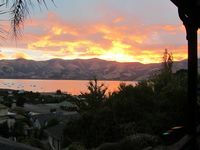 Property 45: Stunning Views,All Day Sun and Amazing Sunsets. Was lovely and warm on a really cold weekend and there was plenty of room for a group of us. Had everything we needed and great view out over the harbour. The house is clean, tidy and has everything one needs for a perfect holiday. The location is quiet yet handy for the town and the restaurants.. The bed is comfortable and the kitchen has all the items you will need if you decide to stay in and cook. The views from the house and the deck are beautiful. A great place to stay.